Even given the usual expectation of rain, August is not something that should generally be feared. The most we might suffer is a spot of sunburn, post-holiday depression, or food poisoning from a festival burger. When compared with the gloominess of February or the terror of back-to-work September, the month is essentially benign. Will Tiote go to Chelsea? Do Arsenal care a less? Will Ba be happy playing on the left or will somebody else take a chance on that knee? Will Man U have a go for Cabaye? Blah de blah de argh. The close of the transfer window becomes something like an inverted Christmas Eve. A Christmas Eve where your mother tucks an excitable child-you into bed, all expectation and wonderment. “Oh mummy, when will it be morning? When will Santa make his stop?”. Lying awake in the darkness, too hopeful to sleep, aching to see the sleigh arc across the night-sky outside the bedroom window. When we he come? What will he bring? Then hoof-sounds on the roof. A scratching sound from the fireplace. He’s here. He’s here! There stands Father Christmas, shaking the soot from his red, red coat. An axe in his hand, blood runs from his mouth. You stare, straining, into the hood. There are flames for eyes, and the red-nosed face of Alex Ferguson glares back. Then post-transfer window morning. The apocalypse. Feral dogs run wild and packs of teenage road warriors stalk the streets. Cars burn and shops lie ravaged. The gates of St James’ stand ajar, smashed savagely aside. Tire tracks of a hundred Range Rovers streak the pitch and Peter Beardsley swings from the Gallowgate. 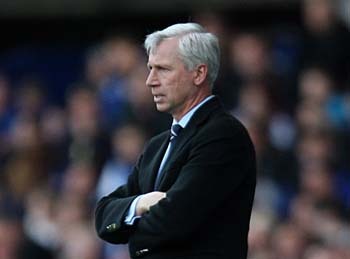 Alone, Alan Pardew sits motionless in the dugout, staring blankly into the distance. He mutters, monotone, “they’ve gone, they’ve gone. They’ve all gone”. You try to rouse him. “Alan it’s alright, it’s okay. There’s cash for January now”. But it’s no good. He can’t be raised. His mind has gone. The night has broken him. Standing in the centre circle, no idea what to do, a rolling laughter fills the air. From somewhere up above, in the clouds, in the heavens, champagne corks pop and someone starts a conga line. Manicured hands and the sleeves of a well-tailored suit appear on a balcony up high, but you’re too far below to see the face of the person they belong too. Sounds cease and a self-contented voice booms loud. “Everything must go! Everything must go! Everything must go!”. If you would like to feature like Adam on our/your website, get writing, ‘The Blog’ is where we profile contributions from anybody who has something to say. Send in your stories of meeting (or not in this case!) your black and white heroes, or your opinions/hopes/fears/articles and we’ll put them up on the website for everybody to enjoy.